JUST ARRIVED!!!!! 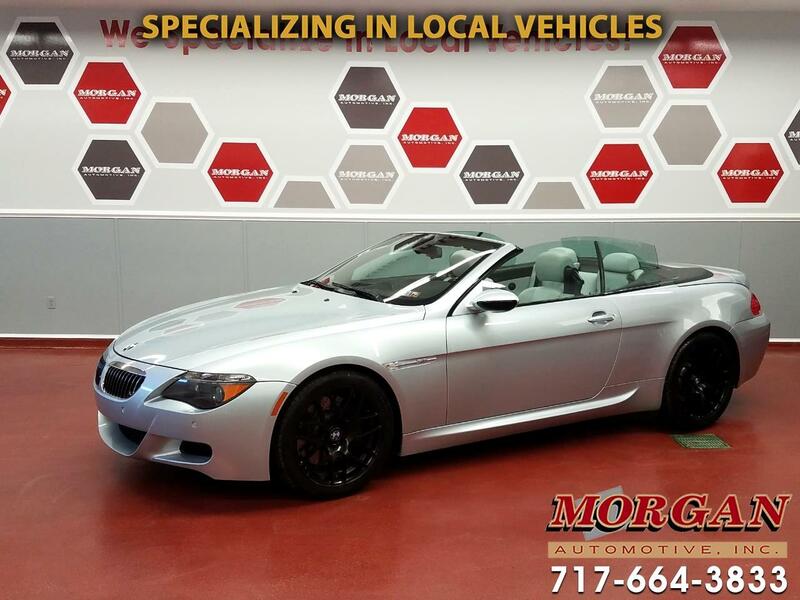 ABSOLUTELY AMAZING AND RARE 2007 BMW M6 CONVERTIBLE WITH EVOTECH STAGE 1 MODIFICATION****ONLY 53,000 MILES****CLEAN CARFAX****You have to see this car to understand its beauty and unbelievable performance! Original MSRP was $114,990! It has every option that was available in 2007 including full carbon fiber package, Merino leather, EDC electronic dampening control, BMW individual audio package with Bluetooth, aux input, High Definition AM/FM/Sirius radio, GPS navigation, HUD heads up display, heated seats, front and rear parking sensors, Bi-Xenon adaptive headlights, BMW M6 factory-embroidered floor and trunk mats. Evotech Stage 1 mod includes ECU flash, speed limiter delete and cat delete which pushes the factory performance from 505hp to 570hp! This car is capable of 200mph+ speeds! This incredible car has a current PA inspection and tires and brakes are in very good condition. This car will not last long so call now to schedule an appointment with one of our commission-free sales people to come see it. Trades are welcome and financing is available. At Morgan Automotive we believe that there is still a spot for a full service dealer. With all the price war's going in today's market some dealer's have chosen to sell at what we call a Johnny Bargain price but quite frankly you are buying the car as it is without it being serviced so what was first thought to be a good deal really was not if you need spend money right after to make it right. We at Morgan Automotive STILL service all vehicle's and recondition along with holding the highest standard possible in today's industry. Each and every vehicle must meet our standards in which are very high and given this along with the continued great service not only before or during but also after the sale . See folk's , we like to simplify the selling process by providing you the customer with a full set of number's not those 4 square's you get at those BIG box stores that hide information from client's and are very straight forward along with a honest approach and do not have all those extra add on fee's that the so called Johnny Bargain dealer's do, just the normal fee's associated with doing a car deal . So if Values and Quality are important to you we feel we are a great choice as they are NOT a thing of the past here at Morgan Automotive. Message: Thought you might be interested in this 2007 BMW M6.